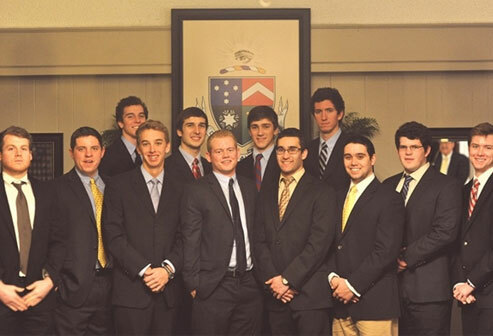 The undergrads of Gamma Upsilon have certainly been busy—and successful—this year. They’ve earned respect across campus and in the local community for recruiting quality members, excelling academically, and demonstrating strong leadership. Last semester alone, the chapter received a top five GPA on campus, won various philanthropy events and hosted several at the house, and initiated 31 new members (after narrowing down 100 recruited). In addition, several members are currently serving on the interfraternity council. But their success doesn’t stop with on-campus achievements. The undergrads are making an impact on the local community as well. One member, Adam Roeckl, is just one shining example. He founded the Sandwich Club at Miami University, and now, club members, including many Delts, make and deliver sandwiches to the underprivileged and hungry in the community. As proud as he is of their academic and rush results, Colton says the true success is in the lasting bonds of brotherhood he has witnessed.